Forums.Celicas.org :: View topic - Puget Sound Toyota Owners Festival 2010! Posted: Mon Aug 30, 2010 6:18 am Post subject: Puget Sound Toyota Owners Festival 2010! So where is this largest annual gathering of Toyota's in the North West? Glad you asked. The Brand New Griots Garage location in Tacoma! We over filled the last location lets see if we can do it here too! Much more parking and it will be designated parking based on Model so be sure to get in your preregistration in! This will help get everything organized for a better event for you. EDIT: Do not worry if when you hit submit and it takes you to a page that says sorry the page does not exsist. Thats a site issue but they are getting e-mailed to us so no need to submit more than once. Now you'll still have to pay to get your car entered in the show and as always we offer a discount if you register before the show. $12 with a NEW/UNOPENED Toy donation for Toys for Tots. $10.80 w/Toy if your a registered Basic Member of PSTOC. $9 w/toy if your a Silver, Gold or Lifetime member. All members are held to a higher standard and required to bring a toy to help the less fortunate. Side note, due to Washington State gaming laws we will not be selling raffle tickets and sadly there will be no car raffle this year but you will get 2 free raffle tickets with your paid entry and can win more by competing in the games and challenges throughout the day! I'd like to put out a HUGE THANKS to our sponsors so far this year! Good news we have a paypal option now! Please visit here if you'd like to prepay and not have to worry about it day of! As heard on "The Men's Room" on 99.9 KISW today! 16min 54seconds in. Yeah we get stoked by the little things in life. If you are registered or are going to register day of please wait for an attendant to show you where to park then proceed inside to the Griot's Store to pick up your registration and voting pamphlet. If you do not have a registration paper in your front window you will be asked to park elsewhere or be at risk of being towed as the show area is strictly for cars entered in the show. There will be some parking in front of the Griot's store and on the side street. If you are to be parked on the concours (grass area) there are some special parking instructions you'll need to follow. Also we will once again be having food prepared by our lovely chef Gabi. It's FREE but we will be asking for a small donation to go towards toys for tots! Also there will be vendors selling stuff on site so be sure to bring extra cash to pick up your PSTOF 10' shirt or one of the many other things offered by our excellent sponsors and vendors. And fair warning please do not burn out, speed, or damage property as there will be Tacoma Police patrolling the area and you will also not be allowed back to any PSTOC events as we do not appreciate negative attention that is brought to our community by incidents such as these. Thank you! And as always remember to get those preregistrations in so we can make parking as smooth as possible. Thank you everyone! And special thanks goes out to all the board member's and volunteers that made this show possible. We do not personally profit from anything we do here on PSTOC so just remember we are here to help share our love of toyota products and meet new friends. So please help us spread the word and we hope a lot of you guys that signed up on pstoc.org will stick around too as your not just a screen name on PSTOC unlike on some of the other boards, your our friends or soon to be friends! Ok now I feel corny and all but thats the only way I could say it right. 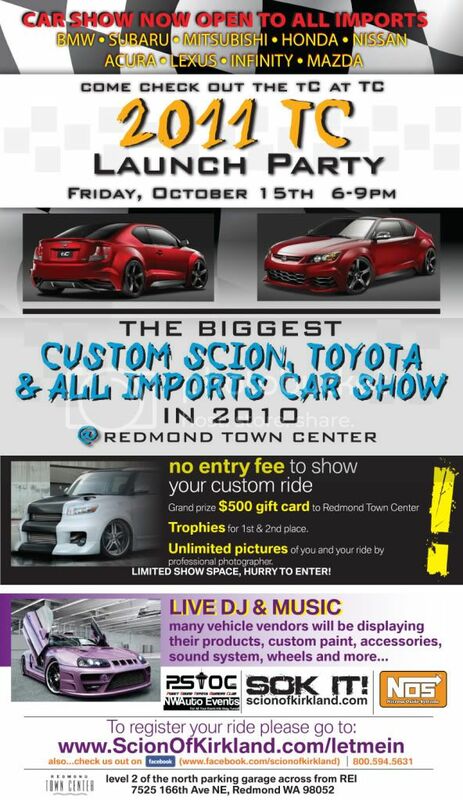 Also if you need another fix of Toyota goodness check out our next event in Kirkland.